MT. PLEASANT—The development of the Historic Railroad Depot on the south end of Mt. Pleasant’s Main Street continues to be stridently opposed. However, city leaders have answers to the concerns of citizens, and they gave those answers at a meeting of the City Council on Tuesday, Oct. 10. Prepared with information from previous meetings and a report by developer George Jones, councilmembers countered antipathy toward the project, which would create a touristy motel out of railroad boxcars. City resident Tia Johansen, continuing the opposition she had previously addressed to the council, informed the council that in addition to her fear of the site becoming a crime hazard, which she had previously enunciated, it had also become a safety concern. She told the council that an elderly person and a child had both been hurt at the site, noting that the site had not been properly fenced off. Johansen also accused the development of being in violation of the city’s zoning codes, which listed the area as being in the public facilities zone. She said that if the city wanted to change the zoning of a city property, there had to be a public hearing, which to date there had not. Johansen lastly presented to the council a list with the signatures of 126 people on a petition who all agreed that the depot, adjacent to the city park, was the wrong location for the railcar development, and that the cars were not “historic cabooses,” as is the railcar west of the depot-turned-craft-store. Monte Bona, executive director of the Mt Pleasant City Community Development and Renewal Agency (CDRA) addressed the zoning issue. He said proper usage of the site had been put before the city’s Planning and Zoning Commission. The commission’s decision was that the development would be consistent with uses permitted under the zoning ordinance. Therefore, since no zone change would be necessary, neither was a public hearing necessary. George Jones, developer of the “Track 89 North” site, reported to the council. He admitted that Johansen’s assertion of people being injured was correct. He said the site had been improperly fenced, contrary to his instructions, and announced that he took responsibility for the injuries and would personally oversee rebuilding of the fence. He also told the council that he would personally build a new soccer field for the city after the current season. Jones reported that as for any personal injuries occurring on the site, his company had taken out a liability insurance policy, with a $1 million per person per injury limit. Jones admitted that the new railroad cars arrived as an eye-sore. However, he had decided to move them to the location before re-painting them so as to be able to paint over any marks made during transportation. Jane Banks, the Mt. Pleasant City recorder, provided minutes of the CDRA going back to December 2015, and showing where the development had been discussed and approved. She also provided the public hearing held on Feb. 4, 2016, where the development of the site was the subject of the hearing. Jones informed the council he had come to the meeting with a cashier’s check to exercise the purchase option for the site, if that would make the city’s job any easier. Councilman Kevin Stallings said it was not the right time to make that particular decision. “It is premature to consider purchase,” Stallings said, considering all the delays and whether the development will actually become operational. Stallings also addressed the location concern brought up by Johansen. He reminded those in attendance that the development was predicated on the value of a historic railroad depot site. If they could not develop there, then the development would not happen. “The Depot is the spot, otherwise the answer is ‘no,’” he said. Jones reported that two railroad cars have been painted, and others will be when placed on tracks. The rest of the cars will arrive next week, and will be craned onto the tracks at that time. All cars will be unmovable. Jones asked if the council would allow for 11 cars to put in place. Stallings said that the agreement was for only seven, and that he would want to see if those all fit in place before considering any more cars. 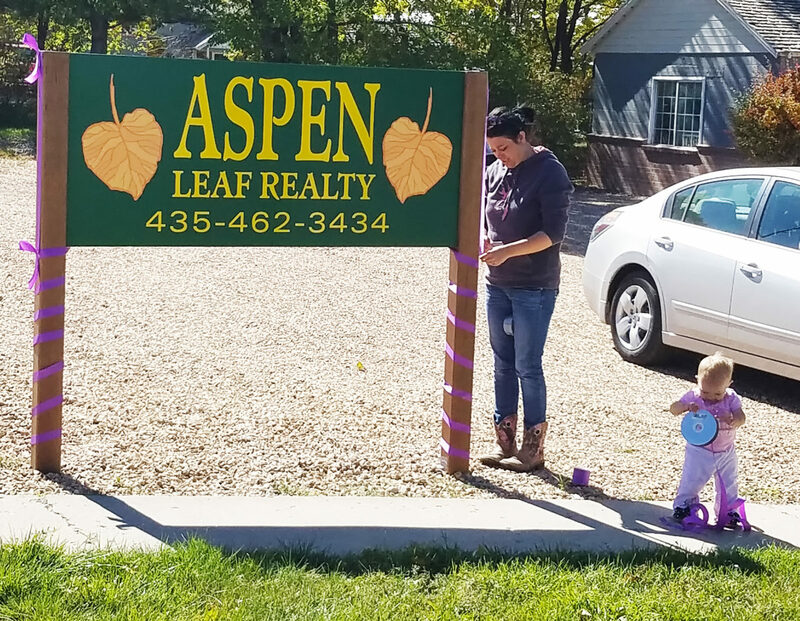 Jessica Poulson (left) and little Kennidie Poulson decorate the Aspen Leaf Realty sign with purple ribbons, the sign of Domestic Violence Awareness Month, which is in October. The Kammy Mae Foundation, a domestic violence awareness organization, is planning a fundraiser at Mt. Pleasant’s ConToy Arena Friday at 7 p.m.
MT. PLEASANT—In observation of domestic violence awareness month, the Kammy Mae Foundation is “painting the town purple” by hanging purple ribbons all over town, and planning a fundraising event for this weekend. 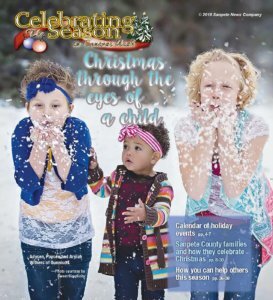 “Domestic violence is a huge issue in this state and people need to help bring awareness to it and start making changes,” said Tammy Coates, foundation founder and mother of Kammy Mae Edmunds, a local woman who lost her life in what is believed to have been a domestic violence-related homicide. 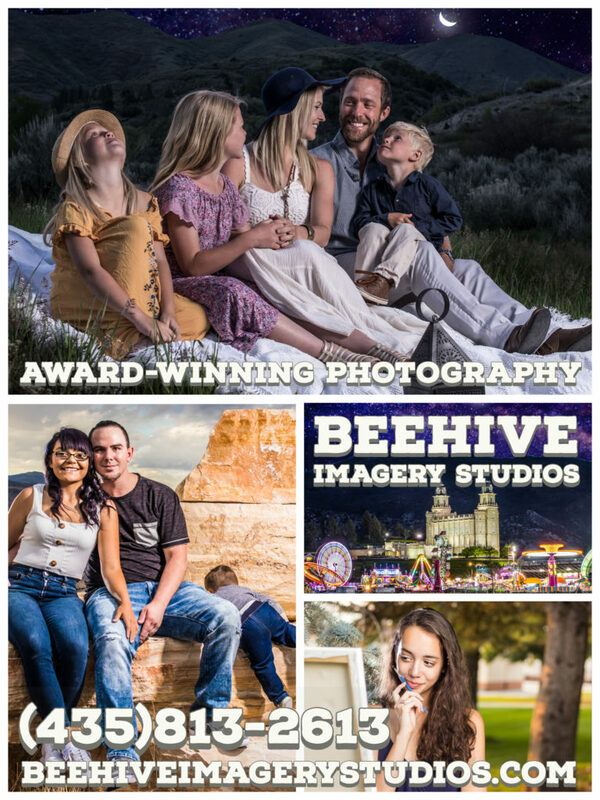 The Kammy Mae Foundation will be hosting a “battle of the bands” fundraiser tomorrow at the ConToy Arena at 7 p.m.
Coates says 28 lives have been lost due to domestic violence in Utah so far during 2017. She and other members of the foundation asked local businesses on Mt. Pleasant’s Main Street to display posters showing a purple ribbon, the sign of Domestic Violence Awareness Month, and information about the fundraiser. “Domestic Violence Awareness Month is October, but to those of us who were a victim and are now survivors or have known a victim, every month is domestic violence awareness month,” Coates says. Before submitting my ballot for Ephraim mayor and city council, I would like to know the candidates’ plans for mosquito abatement and curbing the urban deer population. Thirty years ago, Sanpete County commemorated the 200th anniversary of the U. S. Constitution. Now it is urgent that this inspired document take center stage here again. Don Fotheringham will detail the “Silent Crisis at the Utah State Capitol” in a public meeting held in the Manti City building at 50 South Main St., next Wednesday, Oct. 25 at 7 p.m.
Don, a marine in World War II, including the Iwo Jima campaign, has devoted his life to the defense of the U.S. Constitution and to the promulgation of its principles in the tradition of the Founding Fathers. The importance of protecting the U. S. Constitution cannot be overstated. First and foremost, it was “suffered to be established” by God and He has charged that it “should be maintained for the rights and protection of all flesh.” He holds us, the people, responsible to keep it safe. Surely, we who are heirs of the early patriots who pledged their “lives, their fortunes and their sacred honor” and those through ensuing decades, in war and peace, who have paid the price of liberty, can find time in our busy lives to become informed and take appropriate action at this crucial time. 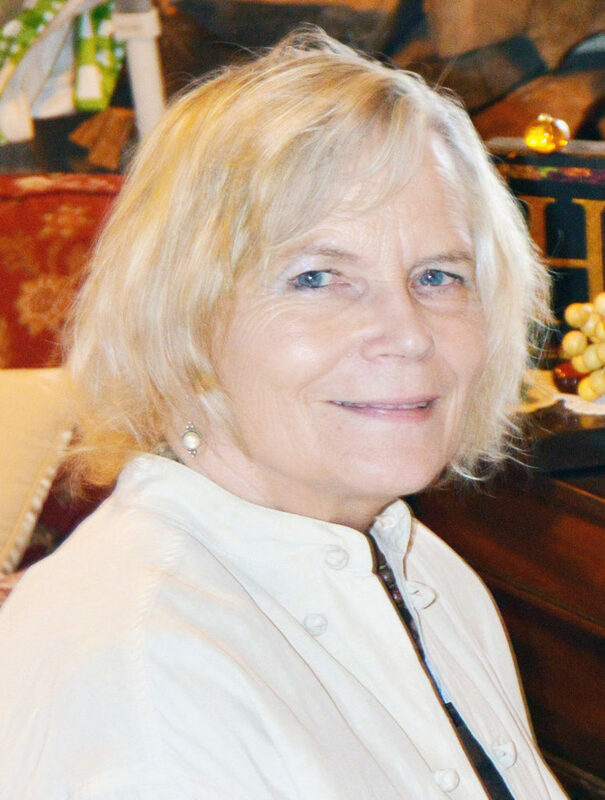 PROVO—Marjorie Monnett, the wife of Spring City Mayor Jack Monnett, who was critically injured in a collision with a garbage truck on Aug. 18, is making significant progress, according to the Spring City recorder. Dixie Earl, who is in regular contact with the mayor and therefore stays updated on the progress of the mayor’s wife, says Marjorie Monnett, 69, was recently released from Utah Valley Regional Medical Center (UVRMC) to a rehabilitation facility. Marjorie Monnett is sitting up in a wheelchair, is talking, is slowly getting her memory back and is figuring out what happened to her, Earl says. Three vertebrae were damaged in the accident. Earl says Monnett has intermittent feeling in her legs. The rehabilitation center plans to focus on occupational therapy for now but has “not given up on walking,” Earl says. “She’s such a trooper,” Earl says, and has talked about getting out and doing her Christmas shopping. The accident happened on U.S. 89 in Sterling when a North Sanpete Disposal truck pulled out of Gunnison Reservoir Road onto the highway without stopping and collided with the car Monnett was driving. She was LifeFlighted to UVRMC. Scott Earl Jones, son, brother, uncle, and friend, passed away peacefully Monday, Oct. 16, 2017 in his home in Manti. Scott was born June 1, 1970 in Mesa, Arizona, where he grew up, attended Mesa High School and Mesa Community College LDS Institute. 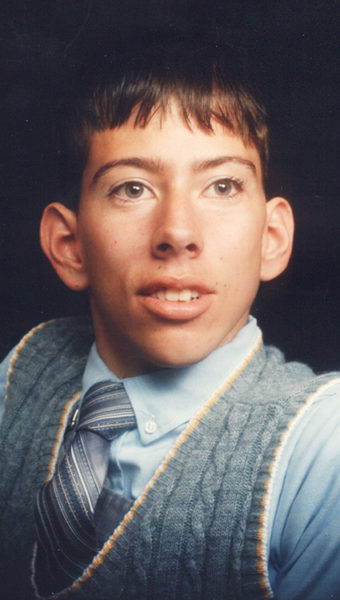 After high school, Scott served as a youth tour guide at the Mesa, Arizona LDS Temple grounds for nine years. Scott moved with his parents to Manti in 1999 and has served as an usher for the Mormon Miracle Pageant for the last 19 years. Scott’s biggest love and greatest past-time included sports of any kind. He could often be found watching sporting events for his favorite teams, which included Mesa High School, Manti High School, Snow College, Arizona Diamondbacks, Atlanta Braves (Dale Murphy), and the Chicago Cubs. He spent his life, and made many friends at softball fields across the country, especially in Arizona and Utah. His family and friends celebrate the completion of a 47 year journey against unimaginable odds. His life was fraught with challenges and trials that few can scarcely imagine. Throughout his journey, he had the ability to lift, comfort and inspire all who came in contact with him. He was quick with a smile and firm with a handshake to everyone he met, and no one was a stranger. Scott is survived by his parents, Wayne and Vatia Jones of Manti; siblings Susan (Mark), Thompson of Grandview, Missouri; Rich (Francie), Jones of Price; and Gerri (Rich), Keiser of West Jordan; 11 nieces and nephews, six great-nieces and great-nephews. He is preceded in death by his grandparents, Raymond and Julia Jones and Herman and Eva Oviatt. Funeral services will be held Monday, Oct. 23, 2017 at 11 a.m. in the Manti Stake Center, 555 E. Union, Manti. A visitation will be held Sunday, Oct. 22, 2017 from 6-8 p.m, and again from 9-10:30 a.m, prior to services. Interment will be in the Manti City Cemetery. If desired, in lieu of flowers, donations can be made to the LDS Humanitarian Fund. Funeral Directors: Magleby Mortuary, Richfield, Salina and Manti. Online guestbook at www.maglebymortuary.com. Johannes Hardy “Joe” Springer, age 83, passed away Oct. 13, 2017 in Provo, Utah. He was born on March 10, 1934 to Johannes Dirk and Adeline Hardy Springer in Fort Benton, Montana. Joe married Sharon Moss on Oct. 30, 1959 in the Salt Lake LDS Temple. Joe spent his early childhood on his grandfather’s ranch in Geraldine, Montana and loved to visit whenever he could. He attended elementary school in Salt Lake City. The family moved to Richfield, Utah in the 40’s and he graduated from Richfield High School with the class of 1953. He continued his education at BYU, the U of U, and graduated from the School of Mortuary Science at UCLA. He served an LDS Mission in the Netherlands. Joe joined his father in the mortuary business in 1959 and owned and operated Springer Turner Funeral Home in Richfield and Salina until his death. 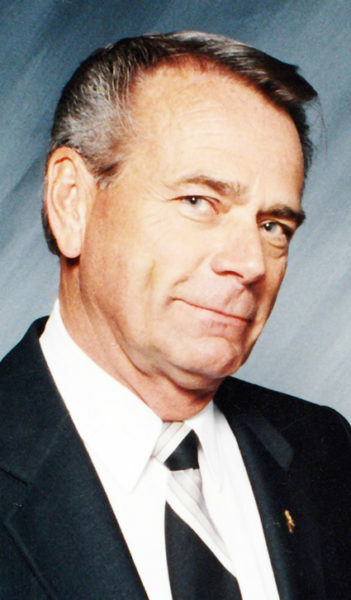 He was an active member of the Utah Funeral Directors Association, where he served for many years on the board of directors, and as the President from 1991 to 1992. Joe was heavily involved in his community of Salina and the surrounding areas. He served many years as an EMT, and an EMT trainer. He helped start the first ambulance service that served the Salina area. He served on the Salina City Council, and he volunteered in many local organizations including the Jaycees, Lions Club and American Legion. 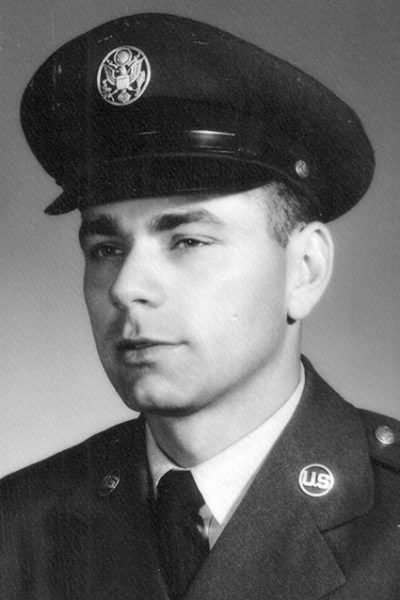 He also served in the Utah Air National Guard. He was a member of the LDS church where he served as a bishop and many other callings in his local ward. Joe loved people, and took any opportunity to serve and or socialize. Joe loved spending time with his family. He enjoyed being outdoors. He liked hunting, fishing and four-wheeling with his sons, and he had a special love for boating on Lake Powell. Joe is survived by his wife Sharon Springer of Salina; sons: Kelly (Ellen) Springer of Delta; Gaylan (Kristen) Springer of Delta; Blake Springer of Salina; His sister Claudia (Norris) Cook of Torrey; 11 grandchildren; 10 great-grandchildren. He was preceded in death by his parents; sister Cherry Eastmond; daughters: Sheila Springer; Linda Jacobsen. The family would like to thank the Cardiac ICU at Utah Valley Regional Medical Center for the loving care of our father. – Especially Phil. Funeral Services were held on Wednesday, Oct. 18, 2017 at the Salina Stake Center. Burial with military honors provided by the Salina American Legion Post #36, under the care of the Springer Turner Funeral Home of Richfield and Salina, Utah. 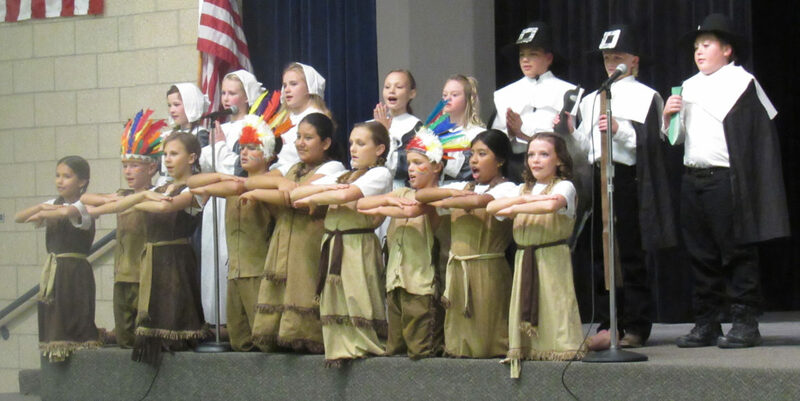 A group of Gunnison Valley Elementary School fifth-grade students perform as pilgrims and Indians in an annual patriotic program on Thursday, Oct. 12, to celebrate Columbus Day. MANTI—As high school students contemplate college, many of them are looking for ways to stand out on their college and scholarships applications. Helping them in this process are their school counseling offices where counselors have access to many opportunities that will help these students excel. One of those, the Freedoms Foundation at Valley Forge’s Spirit of America Youth Conference, was recently highlighted by Manti High Counseling on its Facebook page. “It’s a really good opportunity for our juniors to go and increase their leadership abilities,” said Manti High School Counselor Mandy Thomas. Thomas said she has had some interest from students since the posting and is hoping some choose to apply. The Freedoms Foundation is dedicated to teaching the concept of engaged and responsible citizenship to communities across America. One of the ways it does this is through its campus at Valley Forge, Pa. where several youth leadership conferences are held each year. The Utah chapter usually sponsors about 60 students from across the state who attend the conferences in March and April. “Our goal is to have at least one student from every high school in the state attend every year,” Utah Freedoms Foundation chapter President Dennis Randall said. The four-day conference includes lectures, leadership workshops, living history presentations and historical tours including visits to Valley Forge, Independence Hall, the National Constitution Center and, if there is time, Ben Franklin’s grave and the Betsy Ross home. Students will also participate in the Free Enterprise Challenge where student groups will develop their own product and marketing plan. The Utah Freedoms Foundation chapter foots all but $400 of the $1,200-$1,300 it costs to send each student (that price includes airfare). Participants are expected to come up with the remaining $400 themselves. Students can pick up an application at their school counseling center. Along with the application, they need to submit an essay and plan on an interview with Utah Freedoms Foundation chapter members. Randall said they look for students who are able to engage with others, who, they believe, can get the most out of the experience. In Utah, about 80 to 90 high school juniors apply each year. They try to send as many as the chapter can afford, Randall said. EPHRAIM—More than 200 adults and children gathered on the Ephraim Elementary School playground on Saturday, Oct. 7 for the annual PTA Fall Festival. Youngsters were organized by age categories to play lightning basketball. There was a station where kids made paper airplanes and competed in flying them. There was also pumpkin bowling, face painting, a bake sale, a silent auction and many other activities. Sandra Summers, Ephraim Elementary PTA president, said the event raised a substantial sum for the PTA. MT. PLEASANT—The Mt. Pleasant City Library is starting a monthly Magic Tree House Club beginning Friday, Oct 27 at 2:45 p.m. for children of first- through third-grade age. Magic Tree House is a series of fiction books for young readers based on the adventures of brother and sister Jack and Annie, who discover a magical tree house filled with books. When they open the books, they are whisked through time and space on magical adventures ranging from visits with dinosaurs to walking in outer space. Program director Susan Fullmer said they chose to do the club because the books are so popular with kids. Fullmer said they were introduced to the idea after one of the librarians went to a training and found out about another librarian who had set up a club at her library and was willing to share her resources with others. Based on those outlines, each monthly club meeting will focus on a particular Magic Tree House book. Participants will enjoy activities that go along with the theme of the book, including fun facts, art projects, games and themed snacks. This month’s meeting will feature a make-your-friend-into-a-mummy game and a hot dog mummy treat, for example. The library can accommodate about 15 club participants, so it’s a good idea to call the library in advance and get your child on the list, she said. 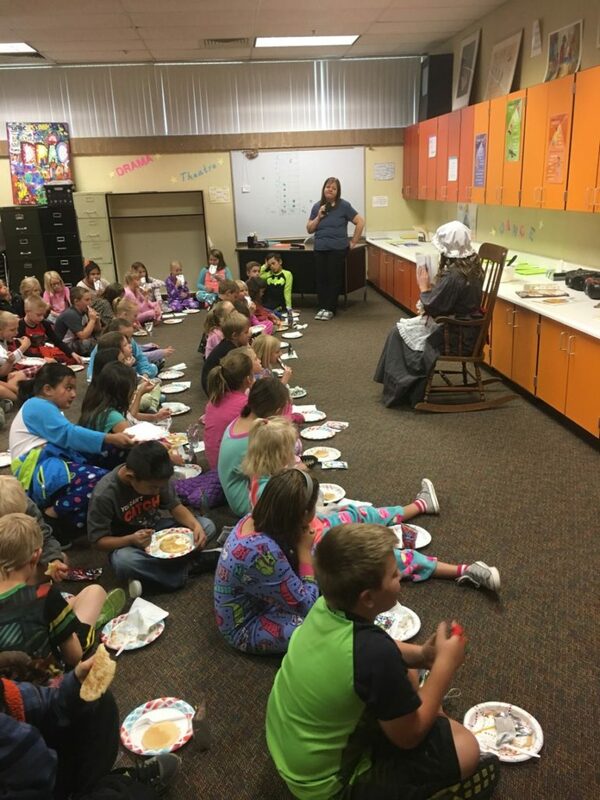 Last Thursday the school hosted a “Pajamas and Pancakes” day as a reward for students with good behavior who have not received a white slip or who have received one and worked it off. Students of the Month in Reading, Math and Leadership (who are chosen by their teachers) run through the halls on the last Friday of every month to celebrate their achievements. Picture make-up day will be Thursday, Oct. 26. Upcoming events include Safety Week, Oct. 30 to Nov. 3 and the Halloween parade on Main Street on Oct. 31 at 12:15 p.m.
Next Monday, Oct. 23, kindergarten students will visit the pumpkin patch at Beck Family Farms in Centerfield. They will learn about how pumpkins are grow and get to enjoy the straw maze and pick out their own pumpkin. Next Tuesday, Oct. 24, will be picture retakes at the school. This week was Red Ribbon Week at the school. The theme this year is “Your future is key so stay drug free.” To celebrate, students were asked to write essays on the theme and winners were chosen and awarded prizes on Monday. Monday was also “Put Drugs to Sleep Day where students dressed in their PJs, complete with crazy hair. On Tuesday the theme was “Make drugs a thing of the past” where students dressed up in clothing from their favorite decade. Wednesday was a camo day with a “Hide from drugs” theme. Coming up next week on Monday, Oct. 23, SMILES Dental will visit the school. Parents can sign up for their children to receive free dental work from the SMILES volunteers. Contact the school for more information. On Wednesday, Oct. 25 at 7 p.m. the music department will hold its fall concert at the high school. The sixth, seventh and eighth grade bands, the string students, the seventh-grade chorus and Opus II, (the eighth-grade chorus) will perform. On Monday, Oct. 23, the school will have its fall concert in the auditorium. The symphonic band, jazz band, percussion ensemble, string orchestra, and the two choirs, SONOS and Cantus! will perform. The choirs have a theme this year of “We are Ohana” and will be singing songs from Polynesian Islands at this concert. 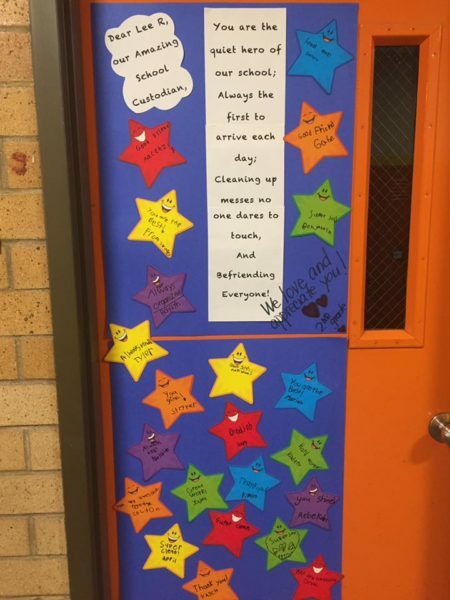 The PTA and students recently decorated custodian Lee R. Sorenson’s door to express their appreciation for him during Custodian Appreciation Week. After a community member donated this pumpkin to the school, the PTA held a contest for students to guess its weight. 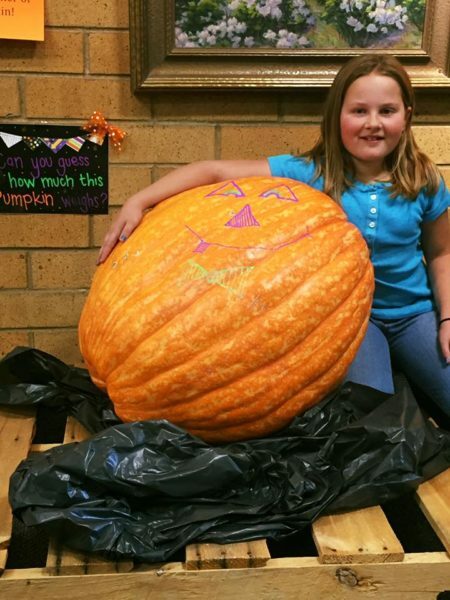 Kaylyn Kelson guessed the closest to the pumpkin’s weight (97 pounds) without going over with a guess of 96 pounds, and she got to take it home last Monday. The school’s fall festival is coming up next Friday, Oct. 27. $5 and $3 punch cards can be pre-purchased at the school or at the festival that evening. Students are again participating in a school-wide reading incentive program called Books and Beyond. The program has been very successful in promoting student reading, and runs through March of next year. During this period, the children will record their reading time and submit it on a “Super Readers!” log. Kindergarteners and first graders will advance one level for every 100 minutes read. Second through fifth graders will advance one level for every 200 minutes read. Students will earn tags for each level in the program. They can collect their tags on a chain that will be given to them when they complete the first level. Next Tuesday, Oct. 24, at 7 p.m., the music department’s performing ensembles will give a fall concert. With a burgeoning music program, they’ve split the jazz band into two bands. Concert-goers will enjoy an evening of choral and instrumental music, including music from the musical “Memphis”, some sword-dancing strings, and the debut performance of MHS Jazz Band A. The Halloween dance and spook alley, which is hosted by the student council, will be next Thursday, Oct. 26, from 6 to 7:30 p.m. Admission is $4. Wear your costume to the dance, there will be a prize for the best costume. H.O.P.E. 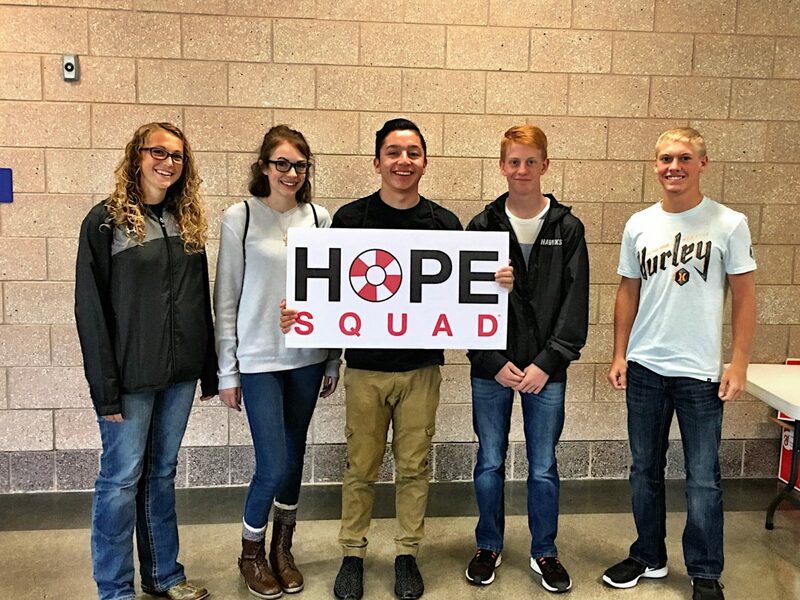 Squad members participated in suicide prevention training at Richfield High School earlier this month, from left, Abigail Clawson, Mayzie Talbot, Christian Sanchez, Devin Palmer and Trey Robinson. EPHRAIM—The announcement by the Boy Scouts of America that it will begin including girls in troops reflects what American families want for their children, according the to the district executive of the Arapeen District of the Utah National Parks Council. But Rawlin Bagnall says the announcement won’t affect 185 troops in Sanpete, Sevier, Wayne and parts of Garfield counties that are sponsored by the Church of Jesus Christ of Latter-day Saints. Those troops will remain all-boy. Bagnall says the Boy Scouts nationally did a lot of research before proposing the change. With nearly 70 percent of mothers of children under 18 in the labor force, the Scouts found families are looking for more reasons to spend time together. One way to do that is to get the whole family involved in Scouting. Two Harris surveys, plus four other national research efforts, found 90 percent of parents wanted their daughters involved in Cub Scouting; over 90 percent were interested in their daughters ages 11-18 participating in other Scouting programs such as Explorers, Sea Scouts, Boy Scouts and Venturing; and over 90 percent of parents believe the values of Boy Scouts of America are relevant to both boys and girls. The national Executive Board of the Boy Scouts was unanimous in its decision to open Scouting to girls, Bagnall notes. That included two LDS board members, Pres. Thomas S. Monson, and Charles Dahlquist, former Young Men’s president for the church. Although Boy Scouting is not available to girls in Sanpete County, there is an active Girl Scout program, with about a dozen leaders and 60 girls. For information, contact Bev Armstrong of Manti, Girl Scout coordinator for Sanpete County, at 435-340-0091. 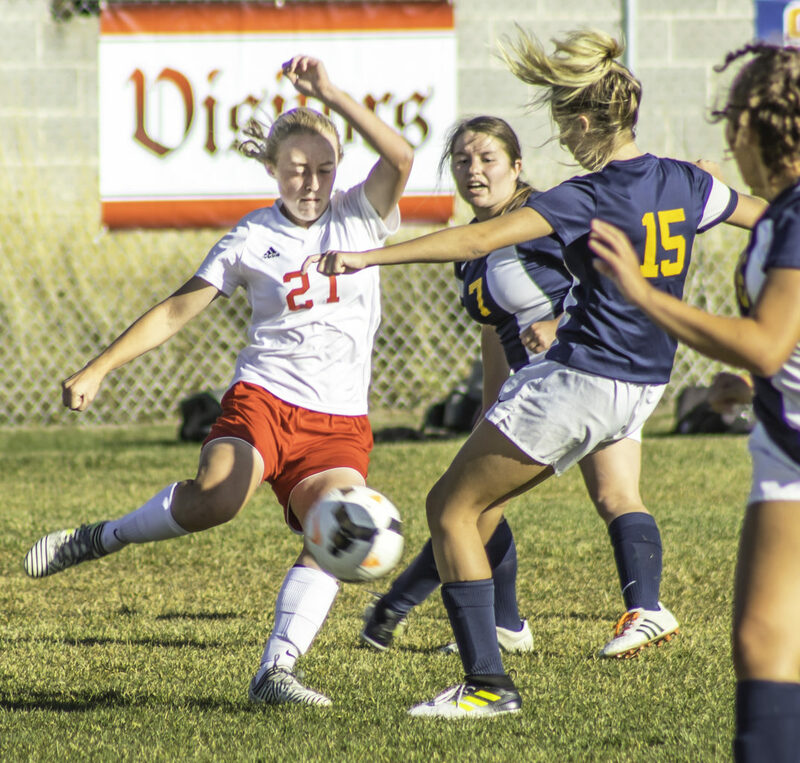 Nicole Nelson (number 21 in this photo) of the Manti High Lady Templars girls soccer team, fights for possession in Manti’s game against Summit Academy on the Wednesday, Oct. 11, Utah State 3A Soccer Tournament first-round playoff game. MANTI—In their last regular season game of the year, the Manti Templars played a hard-fought game against the Richfield Wildcats, but came up short by a score of 30-10. The Wildcats got on the board on their first possession. Led by hard-running, star quarterback Emmet Haffen, the Wildcats used an efficient ground game to go the length of the field and score. The Templars answered back with their balanced run-pass game. The Templars also went the length of the field and scored on a pass from Kyle King to Tanner Rasmussen to even up the score at 7. The back-and-forth continued on Richfield’s next drive. Once again, the Templars had no answer for Haffen and the powerful Wildcat ground game. Haffen scored his second touchdown of the night to go up 14-7. The Templars could not answer on their next drive, but got a beautiful punt from Juan Rodriguez to pin the Wildcats on their own half-yard line. But that was not enough to slow down the Wildcats. With 3:18 left in the half, they were still able to drive down the field, and with 4 seconds left, kick a field goal to make the score 17-7 at half. Both teams seemingly were able to make the necessary adjustments to stifle each other’s offense, as neither team scored in the third quarter. But the Templars were able to gain some momentum and early in the fourth quarter kicked a 24-yard field goal to draw within one score, 17-10. Haffen once more put Manti on its back, engineering an 80-yard mainly by running the ball himself time after time. However, he scored the next touchdown by throwing the ball to Braxton Rappleye to enlarge the Wildcats’ lead to 23-10. The Templars could not mount an effective drive after that. Going to the pass to preserve as much time as possible, they could not make enough plays to score again. Late in the fourth quarter, Richfield tacked on another score to put the game out of reach, 30-10. Manti will travel this week to the Judge Memorial Bulldogs, who are No. 4 in the 3A North, on Thursday, Oct. 19, at 4pm.